Three Hands and a Hound and other artwork by artist G. Harvey can be viewed in our artist slideshow. Three Hands and a Hound by artist G. Harvey and other Gerald Harvey art, art work, artwork, canvases, giclees, images, limited editions, open editions, paintings, paper, pictures, posters, and prints can all be found at Christ-Centered Art. 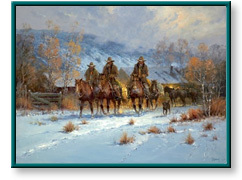 Three Hands and a Hound depicts three cowhands who leave the warmth of their bunkhouse to start their day on a snowy, hazy morning. Not to be left behind, a faithful companion will tag along for a while with them. Once the riders are out of sight, perhaps the dog will explore some new territory before returning to the familiar home he enjoys with the cowhands. Upon returning after a long day, the cowboys can count on being greeted by their faithful "pardner." Three Hands and a Hound by artist G. Harvey as well as other open and limited edition cityscape, Civil War, Focus on the Family, rural, and western paper art prints and canvases, giclees, images, lithographs, paintings, pictures, posters, and reproductions by renowned Somerset Fine Art and Somerset House Publishing artist G. Harvey can be viewed and purchased at special sale prices at Christ-Centered Art.